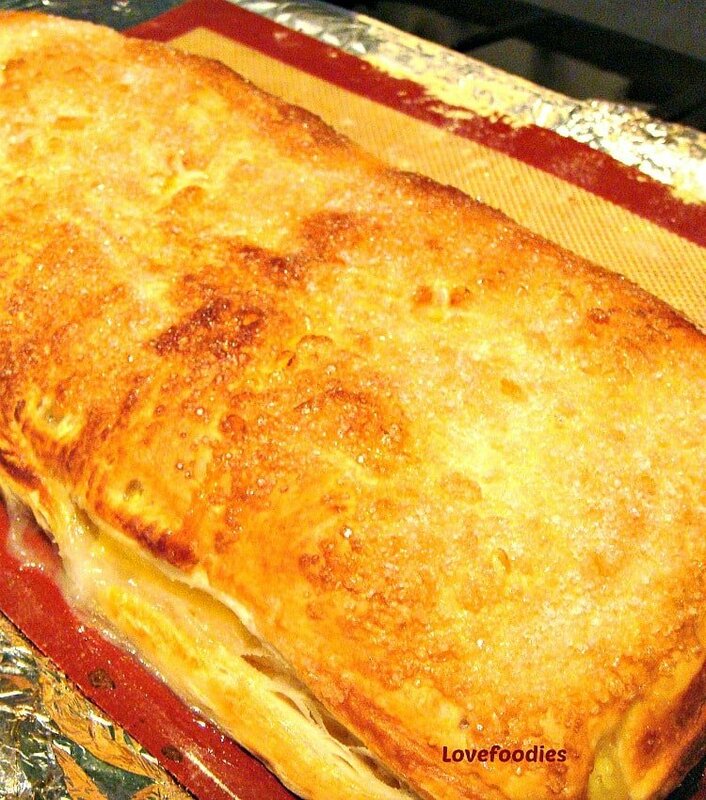 Delicious Apple and Custard Strudel, serve warm on their own or add a blob of whipped cream! Delicious Apple and Custard Strudel. Oh yes! I am sure many of you have heard of if not tasted the famous Apple Strudel, originating from Germany and it can be eaten worldwide and found in many bakeries across the world. But do you know, apple strudel is ever so easy to make? Of course, you could do it the authentic way and use layers upon layers of very very thin pastry and wrap the strudel over and over, but I’ve got a quicker and faster way which doesn’t involve using an enormous work surface to accommodate the thin pastry layers, and it’s equally as delicious! For this recipe, I’ve added a little twist of England. 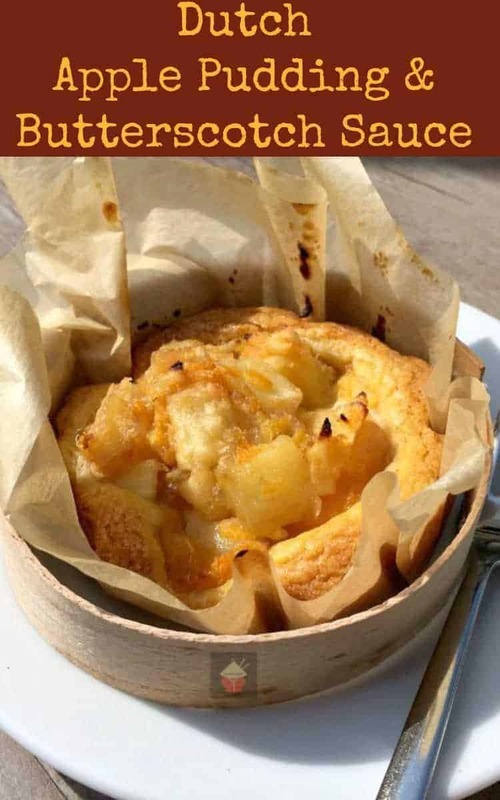 When I lived very close to the border of Germany, Apfelstrudel as it is called there, was everywhere, from the bakeries to supermarkets, you could buy it fresh, frozen, in parts and assemble at home, in restaurants and so on. When I used to eat it at home I would heat in the oven and then make up some custard and pour over the strudel. Then I thought, why not combine the custard into the strudel and eat it like that! 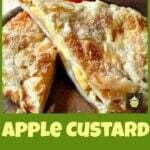 So here’s my recipe for Apple and Custard Strudel. Serve it warm or chilled. I like it both ways. You can also make ahead and freeze BEFORE baking, or freeze after baking and then heat up to make the pastry crispy again. Here, you have the option to buy ready made puff pastry or make our very own easy Flaky Pastry. If you make your own, you won’t be disappointed! Likewise, you can buy ready made custard, or make your own using our Custard recipe. This is a great dessert to serve at a party. Simply slice into portions and people can help themselves, or you can serve in bowls with a blob of whipped fresh cream or vanilla ice cream. Delicious! You may think this is an odd combination, but trust me, it’s absolutely delicious. 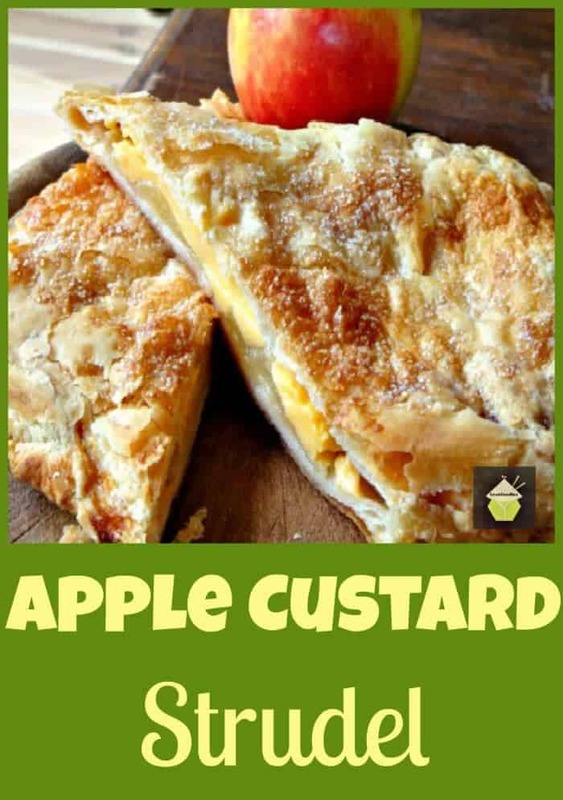 The contrast of the slightly tangy, slightly crunchy apple combined with the slightly sweet, indulgently creamy thick custard filling will leave your taste buds begging for more! So let’s get straight to the recipe and see how we make this delicious Apple and Custard Strudel. Please enjoy! 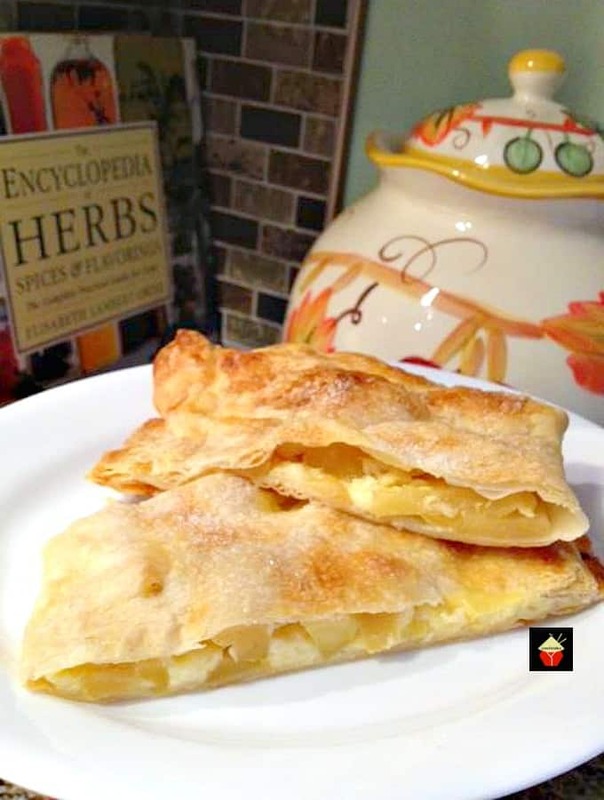 Here’s a photo from one of our readers, Michele Hawley when she made our Apple and Custard Strudel. Michele said it got the thumbs up and was delicious! Thanks Michele for sending in your photo! ** I have used my own homemade flaky pastry recipe. Don’t be frightened at the thought of making your own pastry! It’s a really simple recipe. 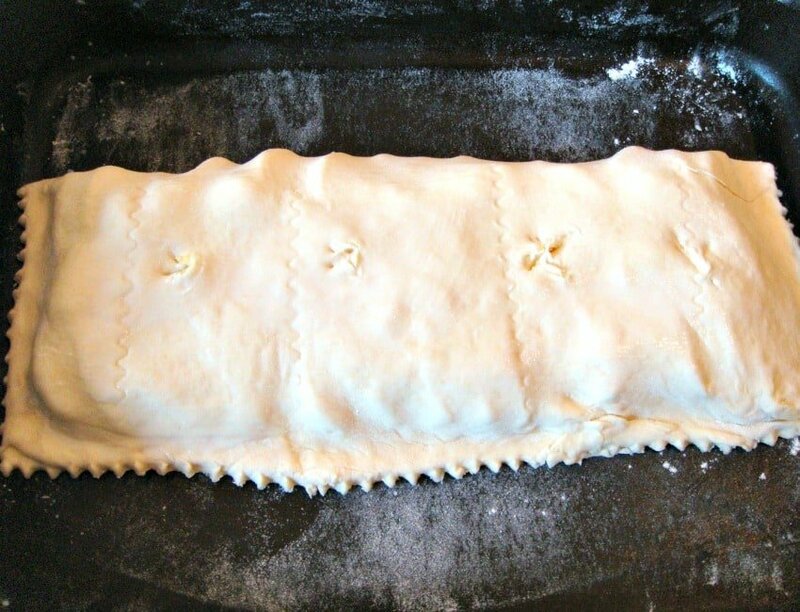 Click HERE to make your own Flaky Pastry. This amount of pastry will make you two strudels, each about 30 cm long by 12 cm wide. If you have too much pastry, it will freeze nicely if wrapped in plastic wrap and a zip lock bag. 1/2 lemon or a squeeze of lemon juice. For our US readers, see here where to get Custard powder. 1. Heat oven to 200C, Gas 6, 400F. Grease your baking tray. 2. Make the custard, by adding custard powder, 1 1/2 tbsp sugar and the milk to a pan and heat until thick. (see photo). Leave to cool until tepid. 3. Peel, core and slice the apples to 1/2 cm thick. Squeeze lemon juice over them to prevent from browning. 4. 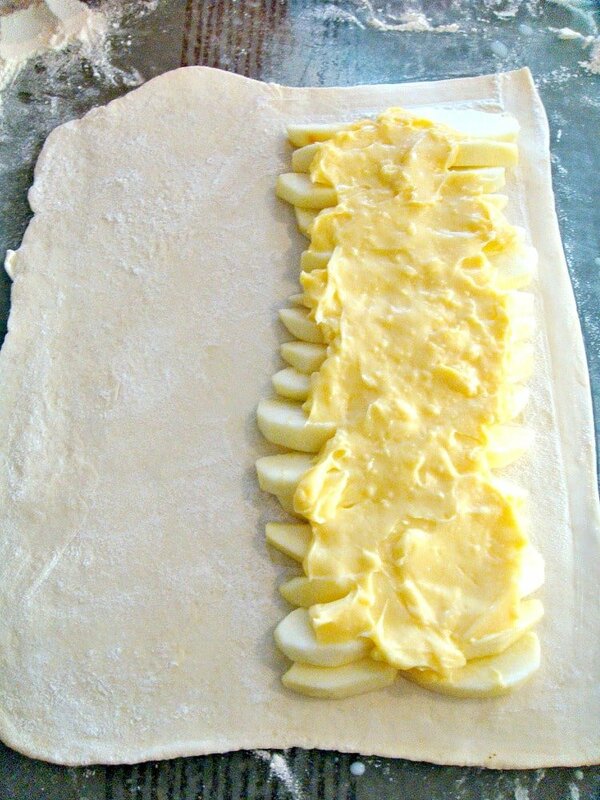 Get your flaky pastry out of the fridge, divide into two and roll each one out until 4 mm in thickness. This will give you two long strudels, roughly measuring 30cm by 12 cm. You can choose to make smaller parcels or one long one, depending on how big your baking tray is! Try to keep a rectangle shape when rolling. Once rolled, place the pastry on the greased baking tray. 6. Brush the edges with milk and fold the pastry over the filling, sealing the edges . 7. Brush the TOP with milk, and NOT the edges. If you brush the edges, it will prevent the pastry from rising! Sprinkle with the remainder of the sugar. Using a pair of scissors, make a few air holes in the top (see the crosses on the photo below). You can also use a ruler to straighten the edges but I like it looking ‘natural’! 8. Place in the hot oven and bake for 25 – 35 minutes or until golden brown. The time will vary depending on how big or small you choose to make your parcels. Ensure the oven has reached the correct temperature before cooking as this will greatly help the flakiness and rising of the pastry. 9. Allow to cool slightly. This is best eaten ‘warm’ as opposed to ‘hot’, either on its own or with a scoop of ice cream. 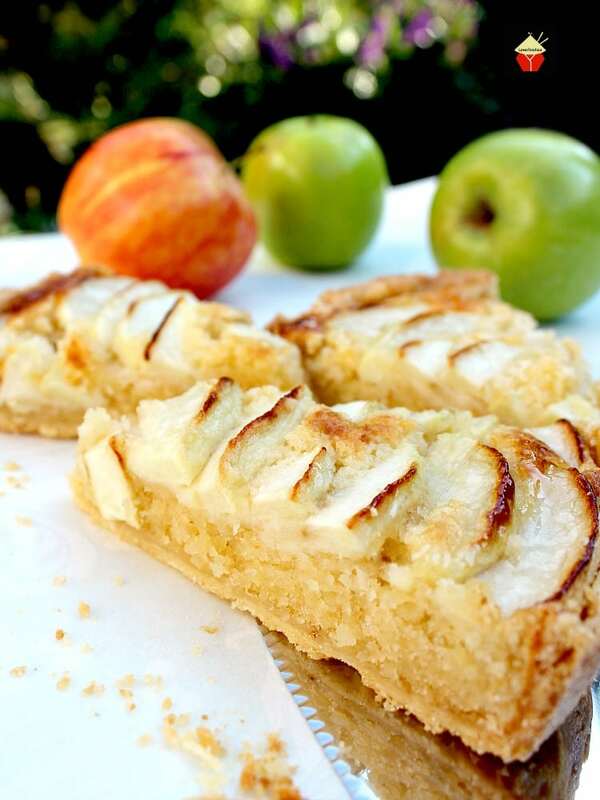 Here are a few more lovely Apple recipes inspired from when I lived in Europe. They’re all really easy and so tasty!!!!! Heat oven to 200C, Gas 6, 400F. Grease your baking tray. 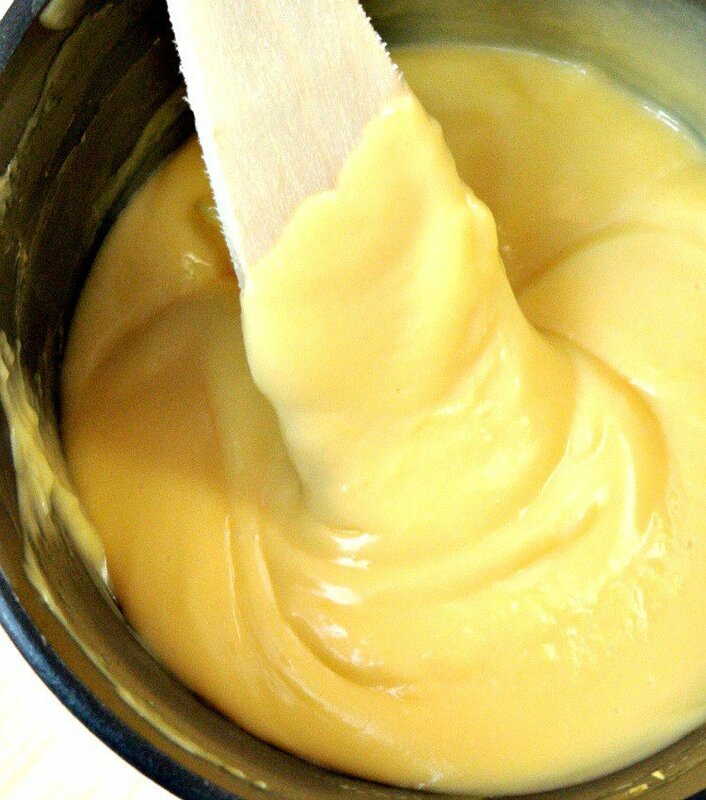 Make the custard, by adding custard powder, 1 1/2 tblsp sugar and the milk to a pan and heat until thick. Leave to cool until tepid. Peel, core and slice the apples to 1/2 cm thick. Squeeze lemon juice over them to prevent from browning. Get your flaky pastry out of the fridge, divide into two and roll each one out until 4 mm in thickness. This will give you two long strudels, roughly measuring 30cm by 12 cm. You can choose to make smaller parcels or one long one, depending on how big your baking tray is! Try to keep a rectangle shape when rolling . Once rolled, place the pastry on the greased baking tray. 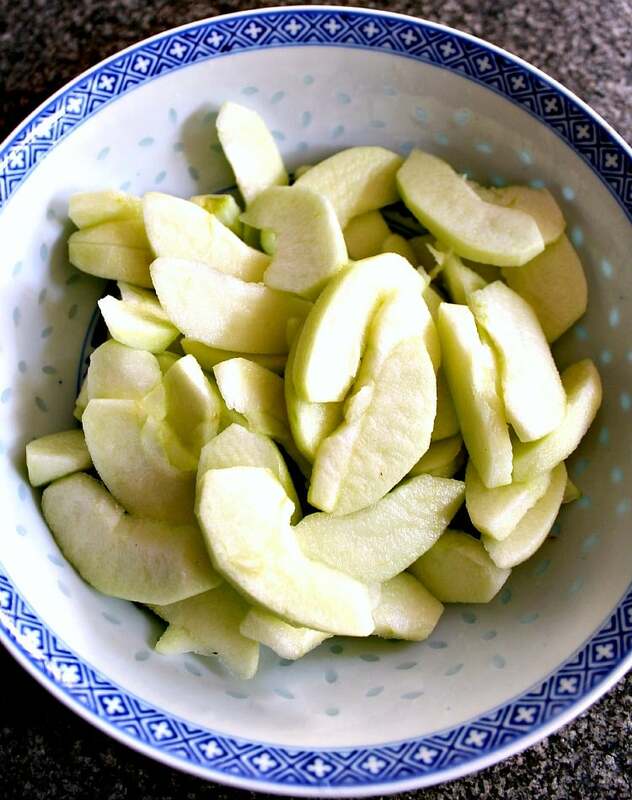 Lengthways, arrange the apple slices so they cover just less than half the pastry (see photo), and spread the custard over the apples. Keep 1 1/2 cm space free around the edges. Brush the edges with milk and fold the pastry over the filling, sealing the edges . Brush the TOP with milk, and NOT the edges. If you brush the edges, it will prevent the pastry from rising! Sprinkle with the remainder of the sugar. Using a pair of scissors, make a few air holes in the top You can also use a ruler to straighten the edges but I like it looking 'natural'! Place in the hot oven and bake for 25 - 35 minutes or until golden brown. The time will vary depending on how big or small you choose to make your parcels. Ensure the oven has reached the correct temperature before cooking as this will greatly help the flakiness and rising of the pastry. Allow to cool slightly. This is best eaten 'warm' as opposed to 'hot', either on its own or with a scoop of ice cream. Please allow extra time if you are making your own pastry and custard. Mouth watering the way it is presented and described. On top of that, I love the metric measures, because That is what I grew up with in my father`s European bakery. In fact most of our recipes were in percentages of the main ingredient. wonderful-love it love it love it!!!! Thanks for visiting and glad you liked my recipe Evelyn! Pin away til your hearts content! Thanks very much Dawn for allowing me to share it!